The Pro 7000 combines lateral rotation and "true" low air loss in one mattress system. The powerful yet quiet user friendly pump produces 52 LPM (liter per minute) of air flowing directly under the patient keeping them cool, dry, and virtually free of perspiration. Effective patient lateral rotation therapy with on demand low air loss relief. This system is both simple to operate and affordable. The Smart Support Surface™ provides real time and accurate patient interface pressures below capillary occulsion with enhanced comfort. The "full" turn option of 40° will provide unparalleled pressure redistribution and reduces risks associated with pulmonary complications (pneumonia). This patent pending Drop and Turn Technology ensures the patient safety. Designed to treat and heal up to and including stage 4 pressure ulcers. Reduce the prevalence of pneumonia in long-term ventilator patients. As an intervention for patients at risk for adult respiratory distress syndrome. In treatment modality for patients with lack of viable turning surfaces Provide assistance with patient transfers and direct care activities. The Pro 7000 combines lateral rotation and "true" low air loss in one mattress system. The powerful yet quiet user friendly pump produces 52 LPM (liter per minute) of air flowing directly under the patient keeping them cool, dry, and virtually free of perspiration. Effective patient lateral rotation therapy with on demand low air loss relief. This system is both simple to operate and affordable. The Smart Support Surface™ provides real time and accurate patient interface pressures below capillary occulsion with enhanced comfort. The "full" turn option of 40° will provide unparalleled pressure redistribution and reduces risks associated with pulmonary complications (pneumonia). This patent pending Drop and Turn Technology ensures the patient safety. Designed to treat and heal up to and including stage 4 pressure ulcers. Reduce the prevalence of pneumonia in long-term ventilator patients. As an intervention for patients at risk for adult respiratory distress syndrome. Provide assistance with patient transfers and direct care activities. Single high aiflow pump 52 LPM (liters per minute). One pump for both rotation therapy and low air loss relief. State of the art micro-controller technology constantly monitors mattress pressures. Software flexibility allows customer changes (custom pressures, times, and functions). User-friendly control panel with dome keys and LED display for simple user interface, displays current mode, rotation times, angles and mode; and patient comfort pressure level from Soft 1 to Firm 10 (8 ± 4 to 32 ± 6 mmHg). Low Air Loss relief can be turned on or off. During on demand LAL mode the system provides continuous LAL relief. Provides effective static or rotation therapies along with continuous true low air loss relief. Solenoids in the pump hold air for days in the event of power failure, or during patient transportation. Digital cycle time display of 10, 20, 30, & 60 minutes. Lock out key completely locks the control panel, to eliminate tampering of the patient settings, including power switch. The support surface provides continuous and effective rotation therapy with low air loss relief during the entire rotation or non-rotation cycle. Mattress design provides effective rotation angles up to 40° ± 5°. 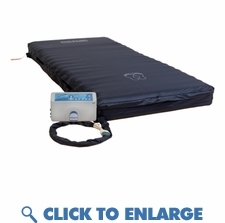 Constant air pressure side bolsters help contain the patient on the mattress during rotation cycles. Side air bolsters can be deflated for easy patient access into and out of the mattress, and also for easy patient procedures. 3 layered zippered top sheet. Top layer is low friction and low shear force producing, and highly vapor permeable urethane coated breathable nylon, the middle layer is a low air loss spacer fabric layer, and the bottom layer is a liquid proof layer. Audiovisual alarms in the event of power outage or low pressures (hose disconnect). Internal memory always retains current settings during power outage, will resume desired operation upon power restoration.